The perfect companion to any fine pen is quality stationery we have selected a variety of notebooks and journals to satisfy any stationery lover. Safely store your treasured contacts in one of these lovely address books. 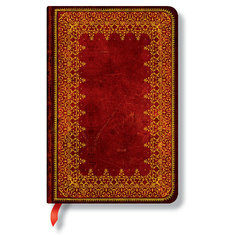 High-quality notebooks and journals from Moleskine and Paperblanks. Ideal for note-taking on the move. Paperblanks are a Canadian based publisher of journals with a vast array of cover designs. Each journal uses modern pruning techniques such as embossing and foiling to recreate is subject to stunning effect. Every Paperblanks journal has either a Smyth sewn or hand stitched binding to prevent page loss and give maximum durability. Moleskine notebooks, often referred to as the 'legendary notebook' are in fact a reinvention of a notebooks previously made in Paris. Used by literary greats and artists alike (Chatwin and Piccaso to name but two) these tough notebooks characterised by their tactile vinyl covers are much loved.